In the (almost) year and a half that I've been writing this blog, five rap songs have appeared in the ARIA top 50 singles chart: "Holiday Rap", "Stutter Rap", "Rok Da House", "Push It" and "The Twist (Yo! Twist)". Notice a trend? Clearly, Australia only liked rap songs if they a) were also novelty records or b) featured female MCs. This week in 1988, another song joined that select group by entering the top 50 - and although it's not strictly speaking a novelty record, it's not far off being one. This segue is just too easy... at the top of the ARIA chart this week in 1988 is another song that's not really a novelty record, but it may as well be. Bobby McFerrin racked up a third week at number 1 with "Don't Worry Be Happy", but I was far from amused. Last seen on the chart with 1986's "Look Away", the Scotish band poked their head into the top 100 one last time with this lead single from fourth album Peace In Our Time. 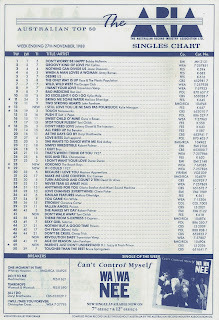 Following the pattern of previous album Dear Children, Joe Camilleri and friends followed a minor top 50 single with a single that missed the printed chart. They'd break that cycle in 1989. Just a few years earlier, this would've been massive. A ballad duet by soft rock hitmaker Christopher Cross and West End star Frances Ruffelle (who doesn't rate a mention on the ARIA chart), it sounds like any number of other '80s hits by Christopher, Peter Cetera or Phil Collins. But, times were tough for the man behind "Ride Like The Wind", "Arthur's Theme (Best That You Can Do)" and "Sailing", and the album from which this single was taken, Back Of My Mind, performed so badly he was dropped by his record label. Frances, who'd originated the role of Éponine in Les Misérables on the West End, would try her luck on the pop charts again in 1994, when she represented the UK at the Eurovision Song Contest. She came 10th. Now, this is a story all about how... two guys from Philly became the first hip-hop act to win a Grammy Award. Introduced at the 1989 ceremony, Best Rap Performance was the first category introduced to encompass the thriving hip-hop scene. I'm a little surprised that it took that long, since, at least in America, rap music had been creeping into the top 40 since the start of the decade. 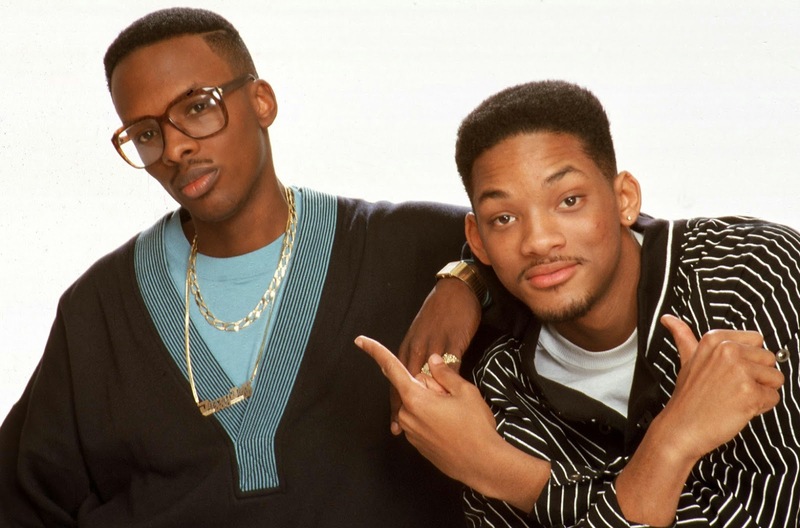 Jeffrey Townes and Will Smith had themselves been recording since 1985 and "Parents Just Don't Understand" was the second single from their second album, He's The DJ, I'm The Rapper. It was also their breakthrough hit, reaching number 12 in the US. Like their debut single, the I Dream Of Jeannie theme tune-sampling "Girls Ain't Nothing But Trouble", the verses of "Parents..." feature fun anecdotes - a trait shared by the only other song to win a Grammy for Best Rap Performance during the category's initial two-year run: "Bust A Move" by Young MC. After 1990, the category was split into awards for solo performers and duos or groups, but it returned as a stand-alone award in 2012. Back in 1989, the inclusion of a rap award at the Grammys wasn't without controversy - but that was mainly due to it not being included in the main ceremony (and given out, instead, at the pre-ceremony). Will, along with fellow nominees LL Cool J and Salt 'n' Pepa, boycotted the Awards, but Jeff did show up to collect their trophy. Incidentally, 1989 was also the first (and only) year an award was given out for Best Hard Rock/Metal Performance - and it, too, was steeped in controversy, but you can read up on that in your own time. Now that "I Want Your Love" had been a hit, some of those previous singles by Transvision Vamp were given another shot at success. "Revolution Baby", although not quite as big, became the band's second chart hit on the trot, while album Pop Art started to gain traction inside the albums top 30. The video we all remember from the time is below, while there's a link to the original clip in the song title above. Here's another artist scoring a second chart hit - and this time the song was just as big as the debut single with "Don't Walk Away" matching the number 17 peak of "Stop Your Fussin'". Although I could never work out just what Toni was singing (in my mind it was: "Don't walk away/don't forget your roller-door"), I did like "Don't Walk Away" - probably because it sounded nothing like "Stop Your Fussin'". Continuing our theme of second singles, here's the follow-up to "That's When I Think Of You", which actually out-performed its predecessor. 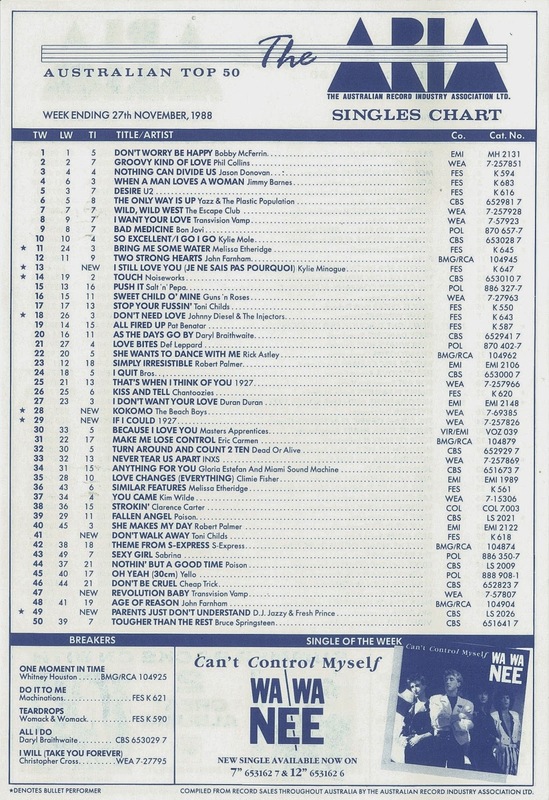 Spending four consecutive weeks at number 4, as well as another four weeks in total at number 5, "If I Could" was one of the biggest songs of the '88/'89 summer. A pop/rock ballad that grandmothers and kids alike loved, the track was written by band member Garry Frost, who'd also co-written the similarly appealing "What About Me" for Moving Pictures (later covered by Shannon Noll). The song that was the song of the summer was this track by one of the biggest acts of the 1960s. "Kokomo" had everything going for it: 1) it was featured on the soundtrack to Tom Cruise's latest hit movie, Cocktail, 2) it was released at just the right time of year to take advantage of its carefree island holiday feel and 3) it featured John Stamos on drums in the video - in a singlet! Unsurprisingly, the track spent seven weeks at number 1 on the ARIA chart, and although I wasn't a fan of the song, at least it was responsible for (eventually) knocking Bobby McFerrin off the top. Poor simple Australia. We clearly couldn't cope with a foreign song title back in 1988 and had to have some nice folks at Kylie's record label rename "Je Ne Sais Pas Pourquoi" with a more palatable English title so we wouldn't freak out. Whether or not this track, which became Kylie's first single to miss the top 10 locally, would have been released here at all if Mushroom Records had their way is debatable - but by this stage, PWL was very much running the show. Besides being another great SAW-written and produced single, "Je Ne Sais Pas Pourquoi" had two other things going for it: 1) Kylie's first classic B-side, "Made In Heaven", and 2) the awesome/cringeworthy dialogue at the start of the clip. I've never noticed before that when Kylie interrupts the "French" woman to ask for the time, the woman is heading inside the building Kylie's standing out the front of. After their chat, the woman turns around and walks off. So easy to be confusing, indeed. Next week: another rap song enters the top 50, and an Australian band follows up a massive number 1 hit with... well, you'll see. "(in my mind it was: "Don't walk away/don't forget your roller-door")"
Ha ha! It was "ripping out the root of love" - I had no idea either until I saw the lyrics in one of those buy-separately Smash Hits lyric songbooks at the time (oddly enough, I don't remember seeing the lyrics printed in the actual magazine). I was never very good with lyrics - but she garbled those ones. I was rather confused when I saw 'Je Ne Sais Pas Pourquoi' listed as 'I Still Love You (Je Ne Sais Pas Pourquoi)' on the 1989 Be Happy compilation released in December. Both Rage & the chart printed in Smash Hits used its original title, and I hadn't yet seen the single sleeve (or the printed ARIA chart). It's a shame that the song title had to be dumbed-down for Australia. I was also quite surprised when it missed the top 10 altogether. I assumed it probably would have been another #1 for Kylie. Even its relatively 'low' (for Kylie at the time) debut at #13 was shocking. If more had been made of Made In Heaven here it might have done better, perhaps. Probably missed the top 10 since a lot of people had it on the album. I much preferred Pat Benatar's Don't Walk Away over Toni Childs and both were released around the same time. Although Toni's song did rock when it was first released, but I got tired of it very quickly. I too was amazed that I Still Love You didn't make the Top 10 at the time. It was a good song. I remember The Factory on ABC, played the video for Made In Heaven, so it did get some exposure. If I Could, just like Don't Walk Away, lost its appeal to me very quickly. I still think You'll Never Know is their best single of Ish, but their lowest chart performance of the singles released from it. I liked Pat's "Don't Walk Away" as well - and it will pop up in the coming weeks. Toni's "Don't Walk Away" is the only song by her I ever liked. I do love If I Could. I was never as massive a 1927 fan as the rest of the country, but that song is a pretty flawless pop/rock ballad for me. @Anonymous - 1927's 'To Love Me', the 5th and final single from '...ish', was actually the lowest-charting release from that album: just outside the top 50 I believe (at least on the AMR chart). The Christopher Cross track was decent but it was no RTTW. I can tolerate early Will Smith, he became to mainstream later in his career. I really don't care for that Transvision Vamp track, I think she rambles on too long. Very decent track by Toni Childs, didn't realize it's from 'Union'. I originally hated the Kylie track but it was due to unfamiliarity, it probly stands up a lot better than a lot of her earlier material. It certainly wasn't as good as Ride Like The Wind!